I have very few complaints in life right now, and those that I do have are ones predicated on the loss of some undeserving great fortune I’ve had–the sort of fortune that is the whim of fate and when it leaves you can only be grateful that it ever arrived in the first place. So on this Thanksgiving, I’m thankful for all the wonderful family, friends and loved ones in my life, and for what seems to be a crack of light rising on the horizon, ever growing, that just may be the glow of a future whose doors had seemed closed for a long time. Here’s to those doors opening further for all of us, and for more grateful Thanksgivings to be had beyond those doors. Happy Birthday, new book. It’s been a long time now that I’ve been home from Japan, but when I dip my head back into the pages of this book that I wrote there, it all comes back again. I’ve heard it noted in the acknowledgements pages of many books, as well as in passing conversation, that writers always forget to thank someone in their books, and while I feel pretty good about the acknowledgements in my first novel, I have found that I’ve forgotten to thank a few really important folks in this second one. Remembered too late. Thank you, Susan Groppi and Karen Meisner, for the most wonderful Christmas package I’ve ever received from anyone. I’d been missing home by that point for a while, and all the stuff you sent allowed me to pretend I was home for the Christmas season, at least. 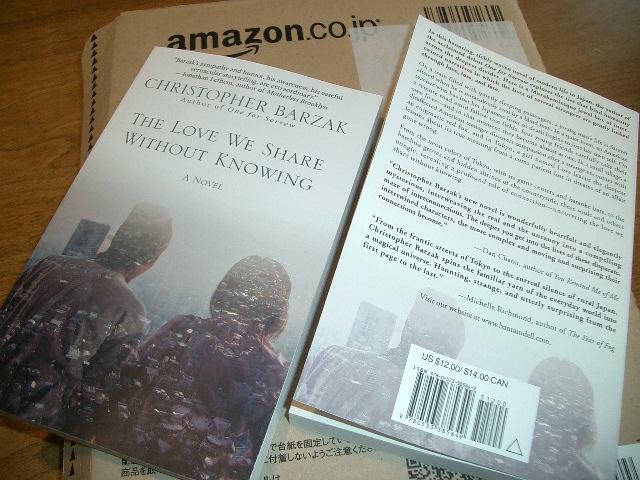 And thank you to the Speculative Literature Foundation, who awarded me a travel grant to visit Kyoto for some research on the place for a section of this book. I hope a belated thanks here instead will make up for a little bit of my forgetfulness. I was interviewed by one of the local newspapers the other day. It was on the phone, though, so apparently when I was using the word “communal” and “communality” the reporter was hearing “commonality” which is fine, because there is that shared-ness in the word “commonality” that works just fine for the meaning I was trying to get at, too. I like the picture of me and my books. The photographer was an older fellow who’s been a photographer on staff for decades, he said, and hadn’t been on my street in years. “I love these old North Side homes,” he told me, and promptly went to my dining room where he found the best lighting like a dog sniffing out a foxhole. Less than a week to go. Fingernail-biting begins. 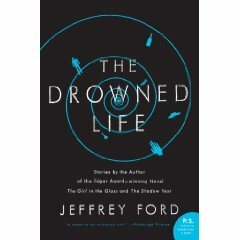 Another wicked good collection of short stories, The Drowned Life, by Jeffrey Ford. Ford’s short stories are some of the best being written today. The have the weirdness and fantastical approach to describing reality that we find in original practitioners of the American short story, like Hawthorne and Poe, as well as the gritty realism that readers have become accustomed to in the short story form over the years. What I enjoy most about a Jeffrey Ford story is that they always capture some essence of the human condition, or create a new way to understand something about our lives that, before reading the story, seems invisible. Take a chance on this book, even if you don’t tend to read short stories. Also, I have not yet learned how to save images from websites on my MacBook yet, so I’m without a cover image here. Anyone want to tutor me? Feel free to send me a message or leave a comment.